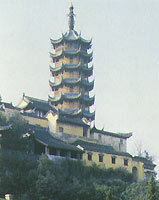 The Jinshan Temple, perched atop the hill of the same name m the north of the city of Zhenjiang, was originally built during the Eastern Jin Dynasty. The buildings on the premises are arranged in layers that hug the hillside in an original fashion. Buildings are attached to buildings to form a group of classical structures whose crimson walls gleam invitingly against the blue sky. The result is a spectacle in which the entire hill looks as if wrapped up by the temple's thick cluster of buildings. Qing emperors, Kangxi and Qianlong, had repeatedly visited the temple during their south China inspection tours. A replica of the Jinshan Temple has been erected in the Mountain Summer Resort of Chengde.